Have you ever found yourself unable to pack properly for a trip because you can’t conceive of conditions dramatically different from the ones you were experiencing in the moment? What I mean here is the way the memory of desert heat becomes impossible to evoke in the depth of winter, or how that same bone-chilling cold is forgotten during a hot and muggy city summer. Forgetting how one feels in certain conditions and thus failing to prepare accordingly can lead to a lot of suffering. This question came to mind as I rapidly fled Island Cottage Woods this weekend. Apparently, since I haven’t yet encountered mosquitoes this summer, I forgot that they existed. This deplorable lack of foresight landed me in an environment with plenty of resident birds that I was utterly unable to watch while being slowly drained of my lifeblood by swarms of ravenous bugs. But where you find flies, you find flycatchers and I found plenty. My favorite was an Acadian Flycatcher feeding its fat fledgling. 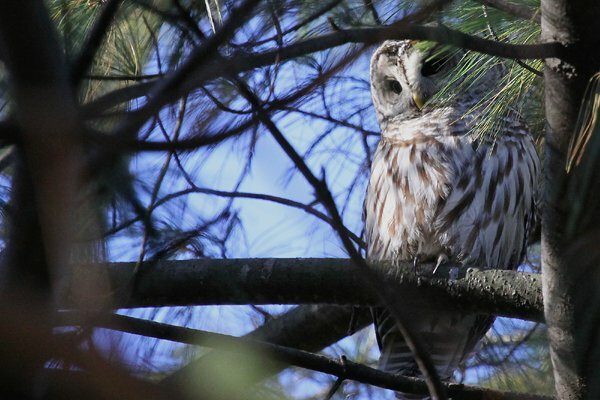 Corey’s Best Bird of the Weekend was a Barred Owl he heard calling shortly before midnight on Saturday night when he and Daisy took a walk at his folks’ house in Saugerties, New York. Something about the sound of a Barred Owl calling from dark woods is just perfect. I go for Northern Waterthrush. Now that many birds are becoming quiet it’s more of a challenge to find them, but Northern Waterthrushes can often find you if you’re in their realm and if they do they let you know. I had 3 or 4 telling me to get lost. One of my favorite places is a trail that leads through a wooded swamp (NEVER forget the bug repellent ! ). That’s where the waterthrushes were plus several Veerys – and they have become much easier to see now that they’re feeding young. Not 100 yards down the James Webb Management Area in Garnett, SC access road did I hear not one, but three, Bachmann’s Sparrows singing in the open pine forest. Later in the morning, one very graciously popped to the top of his shrub for a few minutes while I was about 10 feet away. I believe the final tally was 11 for the day, with 4 sightings. That was a very conservative number considering how many were singing. Awesome day! I didn’t have to see the Baltimore Oriole at Chicago’s Magic Hedge this morning for it to be my BBotW … its clear, loud, and oh-so-pretty song, from deep in the foliage, made it a lock for the honor. Yellowhammer was bird 240 of the year for me.Always tend to see them in the winter.